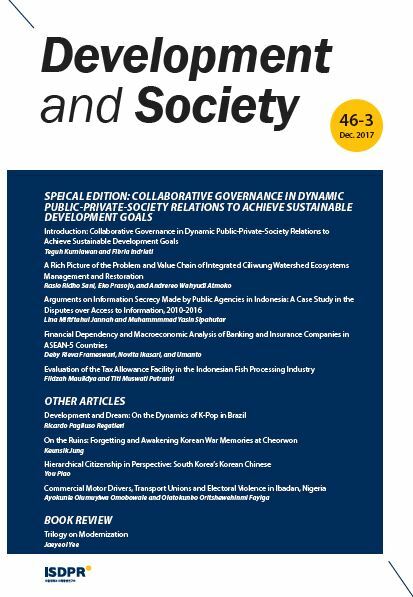 Development and Society (D&S) is an English journal, published by the Institute for Social Development and Policy Research (ISDPR). Formerly known as Bulletin (1972-1989), then Korea Journal of Population and Development (1990-1997), D&S has contributed to share research outputs of Korea to oversea scholars and researchers for more than 40 years. With its history, the journal provides an international and interdisciplinary forum for new ideas and research from social, cultural, political to economic development along with population issues, particularly focused on East Asia. It welcomes contributions that analyze various social causes and consequences of development from diverse authors, countries and research fields. With diversity, it discusses alternative and sustainable forms of development, social quality and related issues, and also proposes new strategies for improving human conditions.